Unfettered II is available for pre-order now! It is the sequel to Unfettered, the bestselling anthology that eliminated my medical debt after I was treated for cancer. 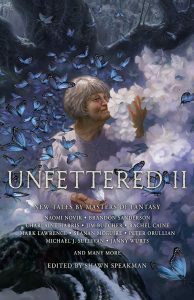 To pay forward that aid, I have put together Unfettered II, a new anthology featuring another great line-up of sci-fi/fantasy authors. All proceeds from the book go toward alleviating medical debt for other authors as well as fund cancer research. The anthology has a duel purpose though. Unfettered II is dedicated to my mother, who passed away from cancer in early 2016. She loved fantasy and many of the writers in the anthology. Todd Lockwood painted her on the cover; my own story memorializes her final days. As you can see, Unfettered II is a fantastic anthology. It will publish December 6, 2016. I hope you’ll consider buying and reading it! Because it was made with a lot of magic. And no small amount of love. Loved the first anthology, can’t wait for this one!